Appointments with a Physical Therapist in Calgary or a Massage Therapist in Calgary may be scheduled over the phone or in person, without a referral. We advise our patients to check with their health insurance company to determine if a referral from a physician is required for reimbursement of any physical therapy costs that may be billed directly to the patient. At Active Physiotherapy in Calgary, a thorough examination to determine your injury and/or severity of illness to subsequently devise your appropriate course of treatment. The assessment can be broken into two main categories: questioning and examination. Upon completion of your assessment at Active Physiotherapy in Calgary, your therapist will inform you of the diagnosis and will outline the treatment plan and a timeline for recovery. Expected benefits of treatment and any potential risks will be explained at the completion of the assessment. Finally your level of participation will be identified and educational materials will be provided if necessary. This process will vary in time depending on the nature, cause, type and severity of injury or condition. We recommend that you wear appropriate clothing for your assessment and appointments. Manual therapy in Calgary involves a hands-on approach to invoke a desired effect on soft tissue, joints and nerves. Our goals are to restore normal function, motion and position and to reduce pain. Therapeutic exercises in Calgary, are explained and demonstrated by your therapist in order to restore and/or improve mobility, strength, balance, endurance and function. Physiotherapists will analyze your ability to perform these correctly and will monitor your progress in order to make changes as necessary to ensure you are benefitting from them. Electrotherapeutic Modalities in Calgary, include various machines we use to assist with decreasing pain and inflammation to facilitate faster recovery to have you back enjoying your activities free of pain and in good health. Education in Calgary will be specific to your injury and/or condition and may address different aspects of your life with respect to work, family, sports and recreation to ensure you are doing all you can for your recovery. Clients with injuries and/or conditions affecting the low back, hip, knee, leg and ankle are encouraged to bring shorts or loose athletic pants as this will assist the therapist in assessing and treating the affected area(s). Clients with injuries and/or conditions affecting the neck, upper to mid back, shoulder and arms are encouraged to bring a loose short sleeved or sleeveless shirt as this will assist the therapist in assessing and treating the affected area(s). Coverage under many health insurance plans and employee benefits do extend to physiotherapy, massage therapy and acupuncture. We suggest you check your individual plans and/or contact your claims representatives to see if you qualify and for the specifics regarding amount and type of treatment. Active Physiotherapy Direct Bills to the Following Benefit Providers: Great-West Life, Sun Life Financial, Alberta Blue Cross, Green Shield Canada/SSQ Financial Group, Standard Life, Maximum Benefit or Johnston Group, Chambers of Commerce Group Insurance, Industrial Alliance, Johnson Inc., Cowan, Manulife Financial and Desjardins Insurance. Individuals are diagnosed and then classified into categories of coverage. Individuals are responsible for initiating a claim with the insurance company within 10 days of their accident to qualify for direct billing to the insurance company for their allotted number of treatments over a set period depending on their diagnosis. A doctor’s referral may be necessary so please enquire with the insurance claims representative. 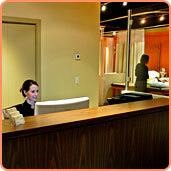 We provide free heated, underground parking for our clients and storefront street parking is also available.